The Macintosh operating system has included Unicode support since version 8.5, allowing applications to see and use characters in both Macintosh and Windows TrueType and OpenType fonts that are outside the 233 characters in the MacRoman character set. Prior to Mac OS X very few applications made use of the Unicode support provided by the operating system, but this situation looks set to change with Mac OS X 10 and there are several text editors and Web browsers that make good use of Unicode. With Mac OS X 10, Apple has started to provide OpenType fonts (*.otf), and has introduced a new format, Data Fork Suitcase Fonts (*.dfont) that cannot be used on Mac OS 9. Mac OS X 10 can also use Mac OS 9 Unicode fonts and Windows Unicode fonts. Mac OS X 10 can access fonts from several locations. When fonts with the same name occur in more than one location, the location that occurs first in the following table takes priority. /Users/username/Library/Fonts Fonts in this folder are called user fonts, and are available only when "username" is logged in. This folder is part of the user’s Home, which can be on the local hard disk or elsewhere on the network. /Library/Fonts Fonts in this folder are called local fonts, and are available to all users. A user with Admin rights can add or delete fonts in this folder. /Network/Library/Fonts Fonts in this folder are called network fonts, and can be made available to all users on the network. A user with Admin rights can add or delete fonts in this folder. /System/Library/Fonts Fonts in this folder are called system fonts, and are available to all users. These fonts are required by the Mac OS X operating system, and so users should not change the contents of this folder. /System Folder/Fonts These are the fonts installed in Mac OS 9, and are called classic fonts. They are available to all users, and can be used by all applications in Mac OS X, even if the Classic environment is not active. Mac OS X 10 did not originally include support for as many languages and scripts as Mac OS 9. Mac OS X 10.1 supported Central European, Cyrillic and Japanese, and Korean, Simplified Chinese and Traditional Chinese were made available as downloads. 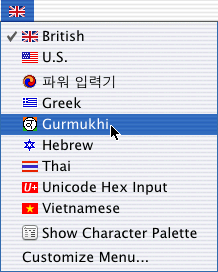 Mac OS X 10.2 introduced support for Arabic, Devanagari, Greek, Gujarati, Gurmukhi, Hebrew and Thai scripts. Additional keyboards can be enabled from the Input Menu tab in the International section of System Preferences. Click to place a tick in the check box to the left of each keyboard that you would like to appear on the menu. After closing System Preferences, there will be a flag in the menu at the top of the screen. Click the flag and a menu of keyboards will drop down. Keyboards can only be selected when a suitable application has focus, so Unicode keyboards can only be selected when a Unicode-aware application is running. Keyboards can be enabled and disabled using the Customize Menu… item at the bottom of the Input Menu. The following list of Unicode OpenType and Data Fork Suitcase fonts is probably not comprehensive, it is just the ones that I have acquired with Mac OS 10.1 on my iMac and with various retail and trial applications, or found on the Web. Not all of the characters in a given range will always be present in a font; you can use WunderMoosen’s FontChecker to see exactly which characters are included. Some fonts contain a few characters from ranges that are not listed, extra glyphs such as lower-case numerals and small capitals, and non-Unicode characters. Fonts that contain only the characters for MacRoman, or only a few additional characters, are not included, and commercial fonts are not included. Apple does not supply any fonts specifically for Greek with Mac OS X 10, but the new Macintosh OS X Unicode fonts Apple LiGothic, AppleMyungjo, Arial, Beijing, BiauKai, Century, Fang Song, #GothicMedium, #GungSeo, Hangang, Hei, Helvetica, Hiragino Kaku Gothic Pro, Hiragino Kaku Gothic Std, Hiragino Maru Gothic Pro, Hiragino Mincho Pro, Kai, Lucida Grande, MS Gothic, MS Mincho, MS PGothic, MS PMincho, #MyungjoNeue, Osaka, Osaka-Mono, #PCMyungjo, #PilGi, PMingLiU, Seoul, Song, STFangsong, STHeiti, STKaiti, STSong, #TaeGraphic, Taipei, Times, Times New Roman, Trebuchet MS and Verdana contain characters from the Unicode Greek range. Alkaios, Everson Mono Unicode, Gentium, GentiumAlt, Helvetica, Lucida Grande and Times contain characters from the Greek Extended range, needed for polytonic Greek.